Before there was Instagram, Yayoi Kusama’s avant-garde perspective was revolutionizing the visual art world. From her vibrant paintings, playful sculptures and captivating Infinity Mirror Rooms, Kusama is by far one of the most important artists to come from Japan. 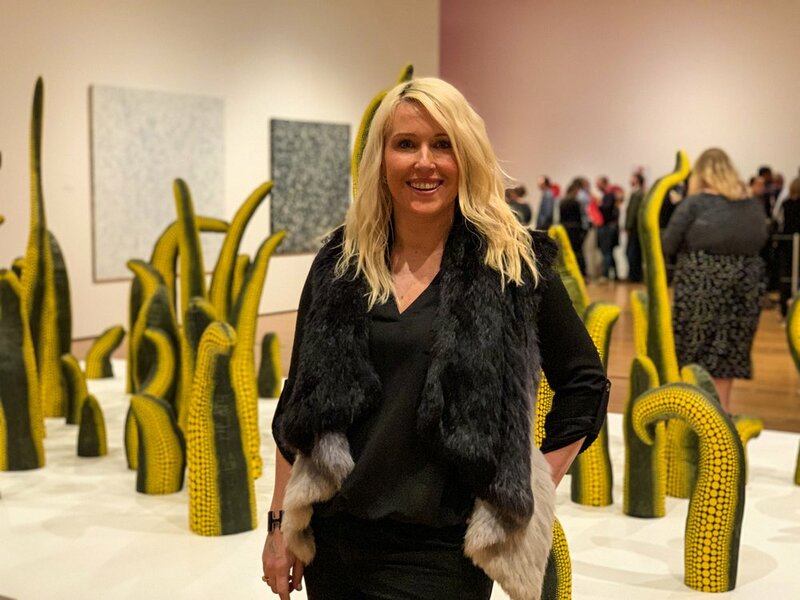 Her artwork challenges the status quo and encourages us to think differently about our connection with the world and those around us. I was first introduced to Yayoi Kusama during one of my many art history classes in college. Despite the fact that I was a business major, art history was always a passion of mine. I fell in love with her use of color and abstract expression, particularly those polka dot pumpkins. If you know me at all, you are well aware of my penchant for handbags. Imagine my excitement when the stars aligned and Louis Vuitton launched the Yayoi Kusama collection in 2012. Needless to say, I was anxiously awaiting the collection’s release. Dots, dots and more dots. Kusama’s collection was bold and playful, each handbag truly a statement piece. Fast forward to fall 2018 when I found out that Infinity Mirrors was coming to High Museum of Art in Atlanta, Georgia. I blocked my calendar and had multiple laptops in an effort to secure tickets. I was ecstatic. Finally, I had a chance to see these extraordinary works in person rather than in an art book. This exhibit made its debut in Washington D.C. at the Hirshhorn and was noted as one of the most significant North American tours of Kusama’s work in two decades. Given her cult following, it comes as no surprise that this ticketed exhibit sold out at a rapid pace. Since its inception, the exhibit has been hosted in five major museums throughout the United States and Canada with the grand finale held at the High Art Museum. The Yayoi Kusama Infinity Mirror Exhibit is something that I will remember for a lifetime. Guests will be consumed with these marvelous sensory experiences but it can be a bit overwhelming at times. In order to have a first-rate experience, I’ve listed a few things you should know before you go. The High Art Museum sold over 120,000 tickets in September for this exhibition. They set aside approximately 100 tickets for daily walk-up. However, they recently announced they will release a limited number of tickets for the week of February 11-17 and no walk-up tickets will be available during that time. Tickets go on sale February 5th, so get your laptops ready as this could be your last chance. Tickets are for a specified time and they request that you arrive 30 minutes early to get in line. Our tickets were scheduled for 6:00 p.m. and we arrived close to 5:30 p.m. and had time to grab a glass of wine before standing in the queue. If you have the option to choose a time, I’d recommend going early so you can go through the exhibit as many times as you’d like. I had no idea what to expect with this exhibit, which is one of the reasons that I wanted to put this post together. After you are escorted to the exhibition room with your group, you are then free to roam and experience each room in any order you please. Each room accommodates two to three people at a time. If you are a couple, you will likely get paired with a random stranger. There are museum docents stationed outside each room with a stopwatch allowing each group 30 seconds of viewing time. There’s no limit to the number of times you visit a room and honestly, I’d recommend going a couple of times, especially if you are seeking that “Insta-Perfect” picture. If you are looking for that “ Insta-Perfect” photo, I’d recommend wearing a solid color ( red, black and white were popular with attendees during my visit) unless you have the perfect polka dot frock you’ve been saving. This would be the time for its debut! I chose to wear all black and I feel like my photos turned out quite well. Although, if I am lucky enough to snag an extra pair of tickets, I’ll swap it up for something a little more vibrant. Let’s talk about footwear. I wear high-heels EVERYWHERE and typically I have no issues. A little word to the wise, wear comfortable shoes. You will be standing in lines for the entirety of your visit and you don’t want to be cranky or rush through because your feet hurt. Photography is allowed throughout the exhibit with the exception of Infinity Mirrored Room-All The Eternal Love I Have For The Pumpkins. When I say no photos, I mean NO photos. Don’t try to take a selfie or snap a quick photo when the door opens. The docent will literally call you out and then check your phone. Most attendees used their iPhones but for those serious photographers, I’d recommend bringing your DSLR. If you choose your phone as your primary camera, I’d recommend bringing a portable charger with you because the last thing you want is to have your phone die before you leave the exhibit. I highly recommend the Anker Powercore. It can charge up to three different phones and has double speed charging. It’s perfect for trips and literally goes almost everywhere with me when I am working on a blog post. Your feet may hurt, the lines may be long and your hair may be a hot mess, but take a breath and marvel in your surroundings. Remember, not everyone has this opportunity and I am truly grateful I had a chance to experience it. 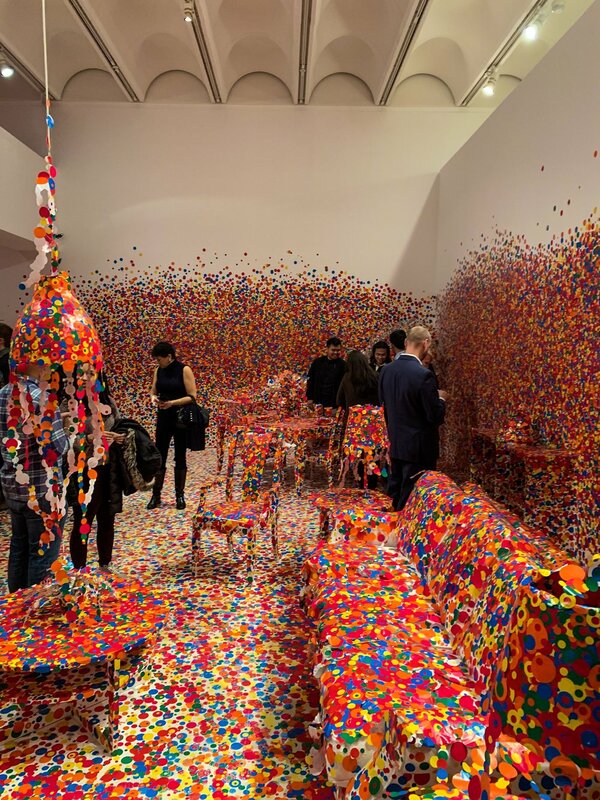 The final room in this exhibit is the Obliteration Room. Guests are advised not to come to this room until they are ready to leave the exhibit. Each guest is given a sheet with five dots in assorted shapes and colors and instructed to “leave their mark.” It’s been quite a treat watching this room evolve on Instagram since it’s inception. To be honest, it was rather challenging to find a perfect place to position my dot given the fact that I am somewhat vertically challenged, but I managed. Note: All dots must be used and cannot be taken out of the room. I hope this has given some guidance to those going to the Infinity Mirrors exhibit. For additional information about this exhibit or how you can purchase tickets, click here.